Thousands of people in shelters in Badulla and Nuwara Eliya districts will have to return to homes in unsafe areas when the risk of landslides lessens until the government builds them new permanent homes. In Badulla alone, more than 4,386 people from 1,209 families are living in 30 temporary shelters. This is in addition to the 1,364 people who were directly affected by the Koslanda landslide last week. “We will be wasting money if we relocate all the people in the camps now to temporary housing,” said Disaster Management Minister Mahinda Amaraweera. The National Building Research Organisation (NBRO) is testing different locations for their suitability as permanent safe home sites. The victims of the Koslanda landslide, currently sheltered at the Sri Ganesha Tamil Maha Vidyalaya in Koslanda and the Poonagala Tamil Maha Vidyalaya in Bandarawela, are set to move tomorrow to a refurbished abandoned factory in Ampitikanda until permanent homes are constructed for them. The former factory is near the Poonagala army camp. 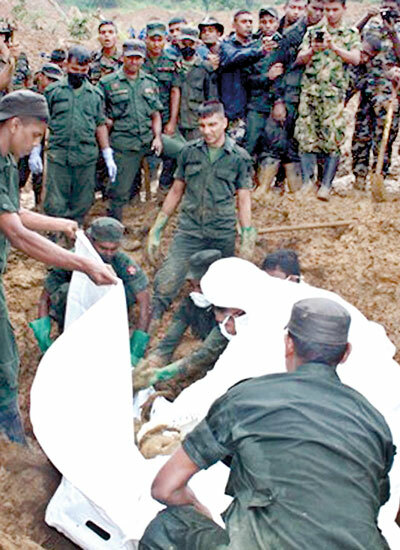 “We hope to renovate the factory and make it hygienic for the people to stay in,” Major-General Mano Perera, Central Province Security Commander, who is in charge of search and rescue operations in Koslanda, said earlier this week. The NBRO has already picked Ampitikanda as the site for permanent housing for the victims of the Koslanda earthslip. The army will be responsible for building the permanent housing for the affected families, with funding and resources given by the government. The army is aiming to complete the 74 houses in three months, Major-General Perera said, adding that progress would also depend on the availability of resources for construction. Meanwhile the Disaster Management Centre said that only 22 people are unaccounted for from the Koslanda tragedy. Out of 34 persons listed as missing by the centre, the bodies of 12 people have been found. The missing persons count was scaled down from the initial figure of 330. The DMC said that 64 families were living in the area at the time of the disaster. This number is disputed by the General Secretary of the Lanka Jathika Estate Workers Union and parliamentarian, K. Velayutham. “We conducted an intensive research to see how many people were dead or missing following the landslide in Meeriyabedda, Koslanda,” he said. “Following interviews with all the surviving residents in the area we were able to find that there are 40 people dead or missing following the landslide. This includes five children and one visitor. The government should relocate these people to a safe place. There was slow progress on the police investigation of the disaster. The CEO of the Maskeliya Plantation, which owns the Meeriyabedda estate, Sunil Poholiyadde, refused to confirm if police had summoned him to make a statement. Badulla District Secretary Rohana Dissanayake said he had no knowledge of such an investigation. The Divisional Secretary too refused to comment on the matter. The internal inquiry in the Disaster Management Ministry is also slow, Mr. Amaraweera claimed. He said some of the ministry officials who are directly linked to the incident are busy providing relief services, so a report would be presented only next week. 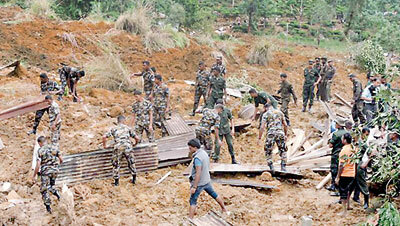 Police Spokesperson SSP Ajith Rohana said the investigation into the landslide disaster has been completed. “Statements from all stake holders have been recorded and the report will be presented to President Rajapaksa,” he said.